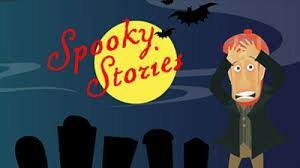 The cost for Spooky Story Day is $2.00 per class per student. Students will pay the teacher whose class they plan to leave to come to the library. So for instance, if you want to come to Spooky Story Day during your 3rd period history class in 7th grade, you would pay Mrs. Rushing (history teacher) during your 3rd period class. Students will have to check with each of their teachers to see which teachers are allowing students leave class and participate in Spooky Story Day. Also, students may come to Spooky Story Day from multiple classes during the day, but they must pay $2.00 each time they attend. Some of the stories may be repeated throughout the day so if a student comes multiple times, they may hear some of the same stories over again. Concessions will be sold and no outside drinks or snacks may be brought in the library. If you have any questions about Spooky Story Day, please contact Mrs. Tew.